Stable, functional and mobile: thanks to its large platform and robust handrail, the seca 677 is very versatile. 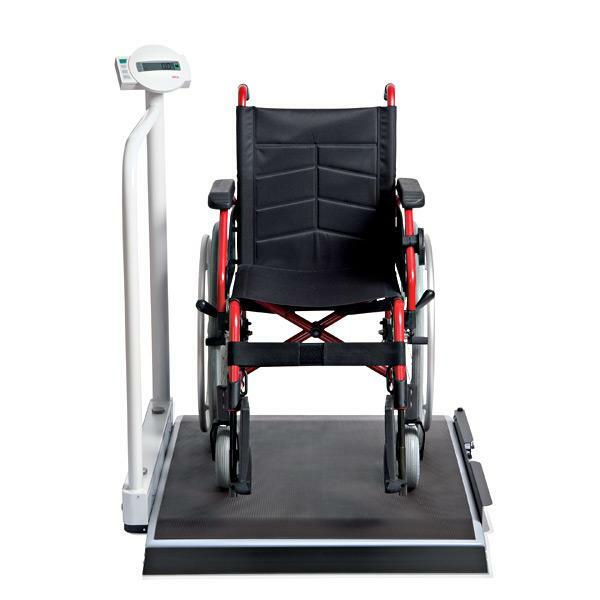 Patients can be weighed sitting in a wheelchair or on a chair. And the handrail provides valuable support for people who are fragile or can only walk with great difficulty. 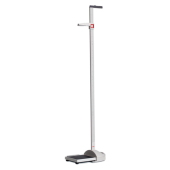 Its high capacity makes the seca 677 ideal for weighing very heavy persons. 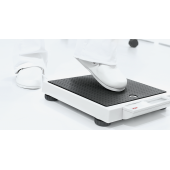 Concomitantly, the scales can be folded together after use in no time at all to save space. The sturdy locking device between rail and platform ensures that the seca 677 stands safely even when folded together. The handrail also serves as handle when the scales are folded together, allowing the scales to be moved around or stowed away effortlessly and quickly on its smooth running transport castors. 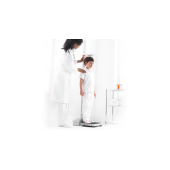 Weighing is simple and user-friendly with the clearly designed, intuitively operable display at hip level and, not least, due to the additional functions such as TARE, HOLD and BMI. The seca 677 is well-suited for hospitals and clinics, particularly geriatrics, gynaecology, nephrology, orthopaedics, nursing homes, retirement homes and rehabilitation centres.